Dusk descends on the ocean's horizon and the energy splashing off the water is hypnotic. It's the time of day that makes you feel anything is possible. All dreams. No limits. 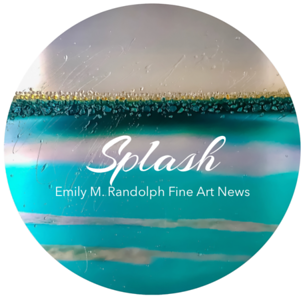 'Horizon Splash' is mixed media on aluminum with aqua blue, gold and titanium reflective glass covered in Emily's 'Resin Splash' technique.